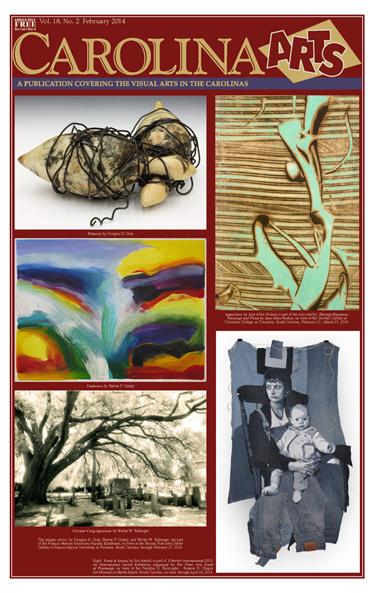 The February 2014 issue of Carolina Arts is up on our website at (www.carolinaarts.com) – all 66 pages of it. That’s right – the same number of pages as last month. Winter has shown its face,but we hope most of that is behind us, so now that you have more time while you’re not out chasing mike and bread, we hope you’ll spend some time downloading our paper, read through it, and send the link to download it to your e-mail, Facebook and Twitter friends. So download that PDF and dig in – it makes for good reading and shows that you have lots of opportunities to enjoy the visual arts in the Carolinas this month. And, don’t forget to find a way to thank our advertisers – they make the paper possible. This entry was posted on February 1, 2014 at 9:10 am and is filed under Carolina Clay, NC Clay, SC Clay. You can follow any responses to this entry through the RSS 2.0 feed. Both comments and pings are currently closed.